In 2012, we started a campaign to distribute 320,000 pamphlets in various cities of England. During the 14 days we spent in England in the last part of September, 2012, we, together with some other Seventh-day Adventists, distributed thousands of pamphlets directly to the people on the street. We distributed the pamphlets in Coventry, Birmingham, Oxford, Wolverhampton, Kettering, Bedford, Lutterworth, Cambridge, Burwell and two parts of London. We are thankful to God for His protection, health and strength He has given us to do this effort. May His name be glorified through all our efforts to give the end time message to the world! We have found that is good tactic is to distribute on the street corners for several hours in a city, then move to another city, then another one and so on. Then we can come back after some days, weeks or months. If we distribute pamphlets in the postboxes from house to house, then we cover street after street until we have finished one part of the city and eventually the whole city. We have also visited many Seventh-day Adventist homes and tried to inspire them to take part in this campaign. The foot soldiers will now continue the work, and when we will go back in June, 2013, we hope that all of the 320,000 pamphlets will have been distributed and that we can print new ones for the June, 2013 campaign. The Greatest Deception in History Will Bring Liberty in Danger! What You Should Know about the Family Day! The Marian Apparition—a Divine Revelation to the Last Generation or a Great Deception? For June, 2013, God willing, we will also print the pamphlets The Struggle Behind the Scenes and Healing. 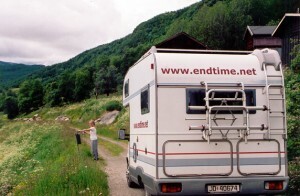 You can read the PDF files at www.endtime.net. Next time we hope to have a man and a woman on every corner when we distribute in the different cities in England. Please pray for this project! from people who have read some of our pamphlets and have seen the truth for this time. Let me tell about one example. Twenty years ago, a lady read one of our pamphlets about the role the Vatican and the United States would play during the end of time, based on Revelation 13. She thought this was interesting, but this information was new for her, so she wanted to wait and see. So she put the pamphlet on a shelf between some other books. As she has listened to the news, she can now see the close connection between the Pope and the last presidents of the United States. When she read about how the Pope is now working for Sunday as a global family day, the Holy Spirit reminded her of this pamphlet she had read 20 years before. She took it off of the shelf and read it anew. Then she saw that what we had written there was just in harmony with what is happening now. She phoned us and told the story, and we could only shout praises to the Lord. Hallelujah! This lady lives on the west coast of Norway. Her home is far from our home, but we have, by God’s grace, visited her and her husband, and we have had many conversations on the telephone. We understand that the Holy Spirit has worked on her mind through the Word, and she has taken a stand for the truth and is now a member of the Seventh-day Adventist church. But she does not keep the light to herself. Now she is very eager to give the light to her friends, and she distributes thousands of pamphlets with the end time message to others. When we sow the seed, the result can come quickly, but sometimes it can take a long time, as in this case. But we have the promise that the Holy Spirit will remind the people of the truth they once have learned, so it is only for us to sow the seed and then leave it to the Lord. May all of us use the time as best as possible now, while we still have liberty to freely give the message for our time!